It takes a Legend...to make a Star. Truer words have never been spoken as pop icons Cher and Christina Aguilera team up for the new musical movie, Burlesque. With its 'Chicago' quality and a some airbrushing which seems to have literally 'turned back time' on Cher's face, this billboard can't help but catch your eye as you drive by, especially if you're a fan of the musical divas. It'll either be very good, or very, very bad (Showgirls bad), in my humble opinion. But that still won't stop me going to see it. 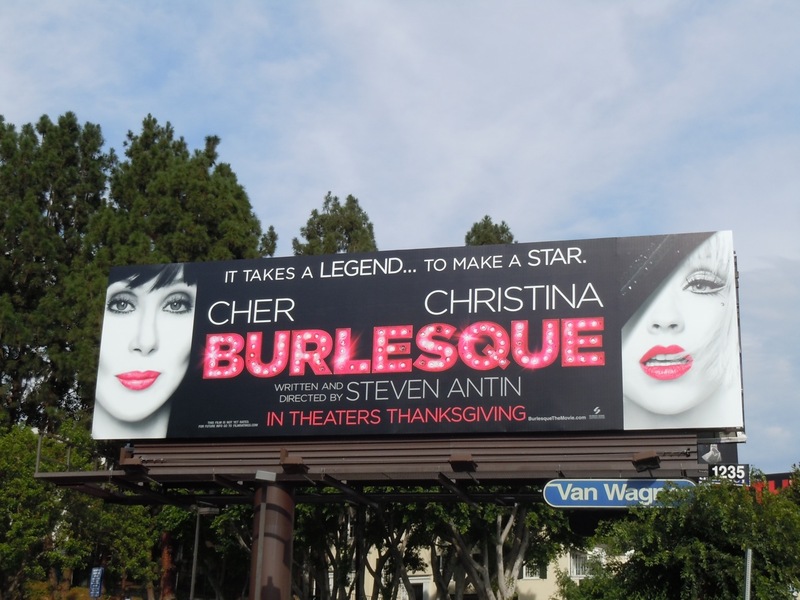 This movie billboard was snapped along the Sunset Strip on October 19, 2010. Check out original costumes worn by Christina Aguilera in Burlesque.